When you bring Chad DeGroot and Terry Adams together for a few days of riding, you know things are going to get interesting. Profile Racing sent Chad DeGroot and Matt Coplon on over to New Orleans to spend some time filming with Terry Adams. Here’s a short but sweet video showing what went down in the two day trip! “A quick trip to NOLA always avails some dialed sessions. We joined Terry Adams and Chad Degroot on this 48 hour sojourn, in and out. Filmed/edited by Chad Degroot/Matt Coplon. Red Bull coming through with an amazing video that’s bound to get some of you old school and flatland guys stoked. They teamed up with Chad DeGroot and Yohei Uchino to look at flatland BMX from the 80’s until now. Obviously that’s A LOT of ground to cover in 4 minutes, so the first half of this briefly covers the past with some costumes, old school bikes and some actual clips filmed from the 90’s, and then we get a few current riding clips that are real good, too. Check it out! “Experience the evolution of Flatland BMX from the 80s to present day. “STAGES” brings together two of the scene’s most iconic riders, Red Bull athlete Yohei Uchino & the legendary Chad DeGroot as they travel through time re-exploring a range of tricks & styles from the Cherry Picker and Scuffing to the highly technical modern era of Flatland BMX. Profile Racing have released their latest limited edition colorway! This time around they have teamed up with Chad DeGroot to do a crazy “Kaleidoscope” color that is loaded with colors, circles and squares that is bound to draw your eye in. Above is a video featuring Chad giving you a look at his current setup dialed in with the parts, along with some excellent riding. Below, you can find more details and a photo of all the parts. Everything is available NOW, so if you’re stoked on it… Get on it right away before it’s gone! 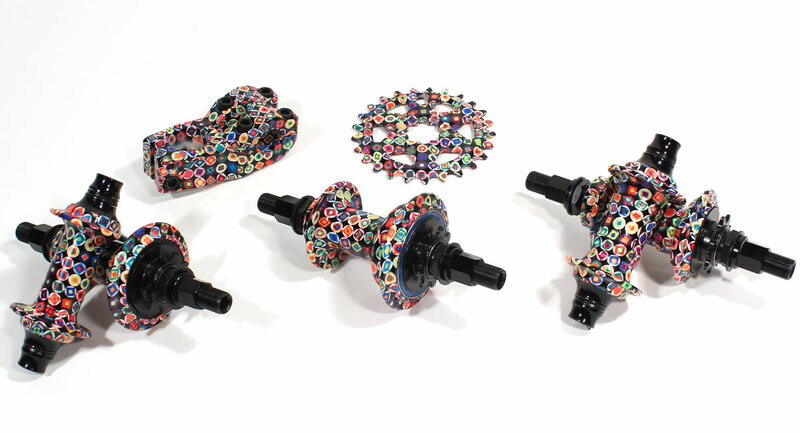 “JANUARY 30, 2017 PROFILE RACING RELEASED CHAD DEGROOT’S COLOR WAY CALLED “KALEIDOSCOPE” WITH A LIMITED RUN OF Z COASTER HUBS, SS MINI HUB SETS, GALAXY SPROCKETS, AND PUSH STEMS. THIS LINE IS AMAZING. WOW. Hard to see? Click here to see it BIG! Deco coming through with a unique promo video for their new Terry Adams signature seat. The team decided to pass one of the seats around and all pull together a clip or two. Hit play and take a look at what went down. This is a rad mix of street, park and flatland, keeping things interesting from start to finish!